NEW 2014 MODEL ALKALINE WATER IONIZER MACHINE. Luxury Alkaline Water System - Best in Its Class! IonTech IT-588 by IntelGadgets 2 YEARS WARRANTY EXCELLENT QUALITY FREE FILTER AND PH TEST. 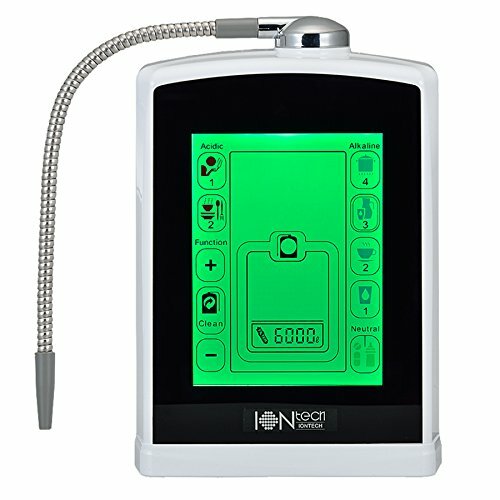 Alkaline Water Ionizer Machine pH Value Range: 4.5-11 ORP Value: -850mv (Max) Huge 8" LCD touch display - A Global Pioneer. Elegant & Easy to use. 7 color LCD display - Attractive & Functional. 7 levels of water pH: 4 levels of Alkaline water, 1 level of Neutral water and 2 levels of Acid water. Automatic 10 second electrolysis chamber cleansing after each Alkaline water use. Records Alkaline water production volume and automatically cleans when production reaches 50 liters Chamber cleansing provides double protection: prolongs the service life of electrolysis plates and stabilizes the Oxidation-Reduction Potential (ORP) value of the electrolysis process. Multi-functional LCD -- Convenient Fingertip Control. Displays pH, ORP, water flow rate, filter life and working status. Platinum-titanium electrolysis plate & ion membrane - manufactured in Japan. Transformer changes the voltage and the supply power for the electrolysis chamber. The transformer changes alternating current (AC) to direct current (DC), changing impedance and separating a circuit. The transformer supplies 100% power to the electrolysis chamber for making the best ion water. This transformer increases the electrolysis power, so we do not need many plates. Our 5 plates work the same or even better then other brands' 7 and 9 plates. High-tech platinum-titanium electrolysis plate manufactured by KOBE Steel, Japan. Ceramic ion membrane manufactured by Yuasa, Japan, temperature-resistant and non-toxic. Activated Carbon Fiber (ACF) Filter manufactured by Pentair, USA - NSF certified Industry leading USA manufacturing technique complies with the highest drinking water standards. 110V US Plug (220V Euro Plug available upon request). Platinum-titanium electrolysis plate & Ion membrane - manufactured in Japan. Adjustable filter life settings for various water qualities. 7 levels of water pH. Large 8" LCD Touch Display. Active carbon fiber manufactured in USA: NSF certified. If you have any questions about this product by IntelGadgets, contact us by completing and submitting the form below. If you are looking for a specif part number, please include it with your message.